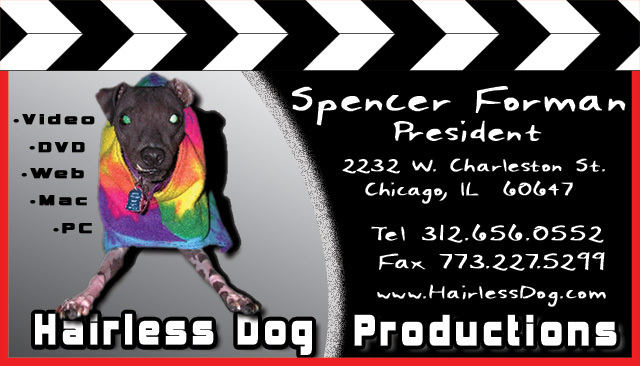 HAIRLESS DOG PRODUCTIONS is a Chicago-based video production company and "adventure" video publisher. Leveraging the power and portability of digital video with the speed and flexibility of modern post-production tools has enabled Hairless Dog to create "studio quality" results on a "shoestring" budget. From initial concept to final DVD authoring, Hairless Dog can handle all aspects of production and distribution. Unlike larger companies with big budgets, we don't eat, sleep, or take a break . . . EVER! Whether you are looking to put together a new web-presence, film a corporate video, or just have some fun with those "candid shots" taken of the boss a last year's company picnic, Hairless Dog can put it all together for you--online or off--line. You guys also offer computer consulting? Then there is the private "rescue" service we offer. Here's the deal . . . we've been monkeying around with computers since the days when an "Apple" was something you put in a pie and "Windows" were something you paid somebody to clean . . . we know what's going on inside that thing you're staring at right now! Anyway, enough of our clients and alleged "friends" have taken advantage of our love of these crazy machines and their inner workings over the years that, quite frankly, we're really kinda tired of "giving away the milk for free." So, we rounded up everyone we knew and asked them if they would be willing to pay for the kind of personal, knowledgeable, and entertaining computer service that we've been providing all these years . . .
After everyone picked themselves off the floor and stopped laughing, they tilted their heads at a strange angle towards the sky, became a little "teary-eyed", and spoke out together in broken-little whisper . . ."you gotta do what you gotta do." Hairless Dog is now accepting individual applications for personalized computer consulting, on both Apple and PC systems. You name it, we can do it. Whether you just need help learning a specific program for work, or you just deleted an entire year worth of tax records . . . we can help you out. We're fully versed on about 90% of the software in the world, and if we don't know it . . . we'll learn it before we come to your place. Oh, did we mention that we make house-calls? Bet you haven't heard of that kinda service in a while? But you know, we don't just do this for anyone. We've got to draw the line somewhere . . . there are only so many hours in the day. So here's how it works: IF you are new, and we've not worked for you before, give us a call or e-mail us with a description of your problem, where you live, and whether you want us to schlep to you or you to us (We're in Bucktown, off 90/94 at the Fullerton Ave. exit in case you haven't read the address on the big-red business card above!). IF we can likely solve your problem, then we'll set up a date. If not, we'll give you the name of a good bar to go get a drink and soothe your frazzled nerves before you go out to buy a new computer or a sledgehammer for your old one. Why are we called "Hairless Dog"? See For Yourself . . .